We wanted to give you the most complete and detailed guide on kitchen knife sharpening for beginners- for free! The majority of people do not know how to properly sharpen a knife. While there are tools that partially automate the process so that just about anyone can get acceptable results, there is no substitute for proper sharpening. It is an art that must be learned and developed. A well-sharpened knife is an absolute pleasure to use… a dull or cheap knife is a nightmare, and can actually hurt you. Most accidental knife wounds are the result of poorly sharpened blades. A properly-sharpened knife will never slip while you are cutting with it, and will glide smoothly through what you are cutting. Dull, and cheap knives jerk through, in stages, causing slips, tears, rips, poor slices, and accidents. The purpose of this manual is to educate you, both on kitchen knives, how to properly sharpen them, and the tools and techniques you will need to accomplish this. If you’ve only read about knife sharpening or have already begun to sharpen your kitchen knives, if you want to learn more about the right techniques to sharpen a blade, this guide is for you. If you’ve already mastered the basics of knife sharpening, and want more, this guide is for you. 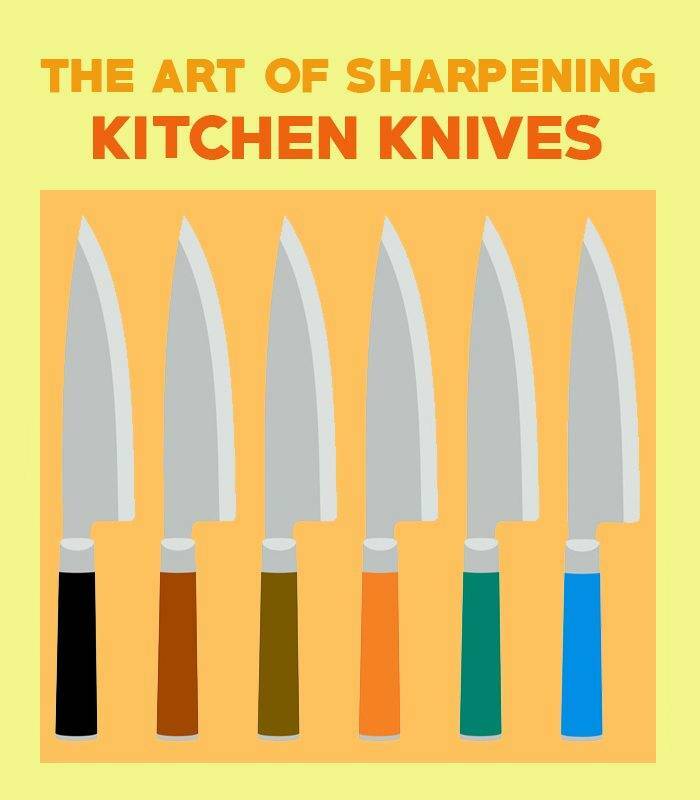 The Art of Sharpening Kitchen Knives is for anyone looking to take their knife sharpening skills to the next level: chefs, home cooks, knife lovers… This guide provides you with both theoretical and practical tips to help you master the art of knife sharpening. HOW MUCH OF THIS GUIDE SHOULD YOU READ? To get the most value, you’ll want to read the entire guide! To start, you might read whatever chapter applies to you right now, but it can definitely benefit you to read the whole guide. We’ll start from the basics, analyzing the parts of a kitchen knife, and what each part does. An in-depth overview of knife steels and how they affect sharpening. We’ll help you choose the right knife sharpener for your needs, telling you the pros and cons of each and giving you tips and recommendations. We also included extra tips and pieces of information to help you get your knives as sharp as possible. Peter Nowlan, a professional knife sharpener, will take you through the step by step process of sharpening a kitchen knife: from dull to sharp. This is the cheapest way to do it, and also one that will teach you important lessons as a knife sharpener. We’ve interviewed 55 professional knife sharpeners, asking them for their best tip to a newbie knife sharpener. USE THIS GUIDE TO TAKE YOUR KNIFE SHARPENING SKILLS TO THE NEXT LEVEL. I searched for sharpening guides… found this… thanks so MUCH!!! A very good site for both the novice as well as experienced knife makers. I am making my first knife, using an old lawnmower blade, so I have been searching the web for info. I found your site very, very informational on most aspects of the knife blade. I will be coming back to your site as my project continues and will be referring friends and family to Knife Planet. Thank you. When is peters second video in series coming out? Have You Noticed The Knives in These Five Iconic Movies?